While camping alongside the actual rim of the Mogollon Rim we took many hikes to explore the area around our campsite. On one of these hikes we came across a predator and its prey towards the end of their life-or-death struggle. Walking along, Willow by my side, she suddenly jumped back, assumed a wary posture and began sniffing around the area obviously enthused about finding whatever it was that had startled her. I stepped back, stopped moving and began to scan the area around my feet just in case it was a rattlesnake. Now Willow has had her rattlesnake vaccine but that just means I have a bit more time to get her to a vet. I, on the other hand, have not had a rattlesnake vaccine and would prefer, like really really prefer, not to get bitten either. 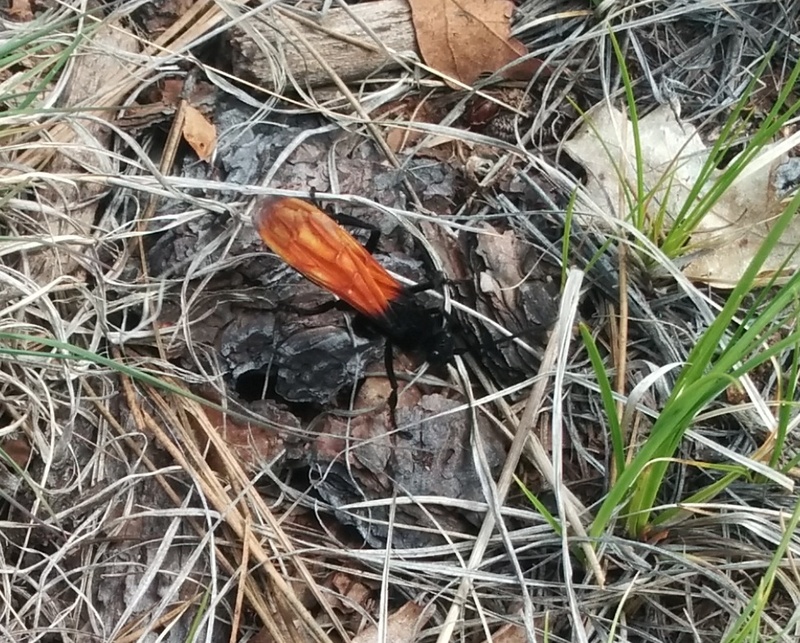 Soon enough a movement out of the corner of my eye caught my attention and I looked down to see a Tarantula Hawk, one of the largest wasps in the world and found all over the Southwest region. It was frantically flitting about in jerky motions obviously looking for something on the ground with seemingly no intention of flying away even though both Willow and I were quite close to it getting a good look. 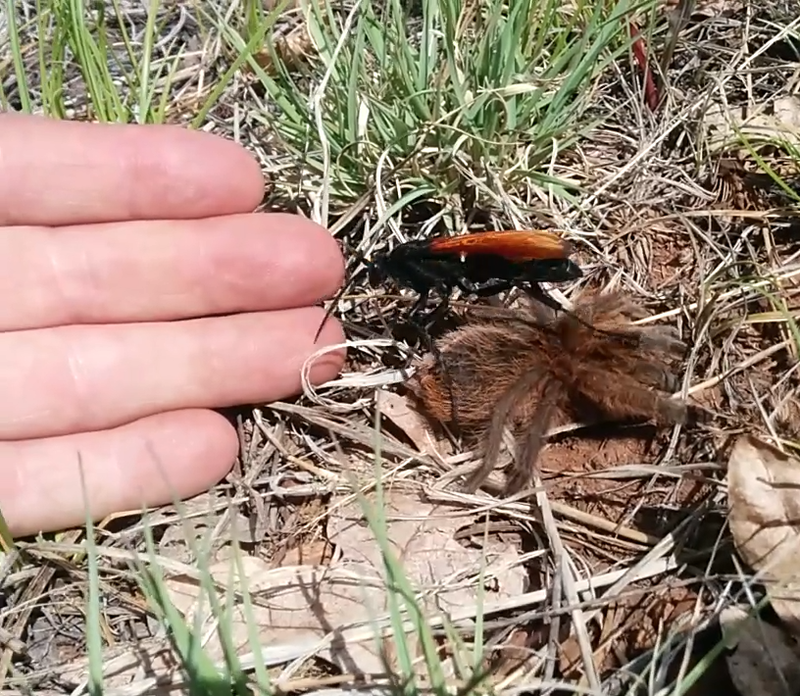 Soon enough it circled and jumped on something I at first thought was a piece of bark until the Tarantula Hawk grabbed it with its mandibles and the “bark” moved a bit in obvious distress. It was a Tarantula. 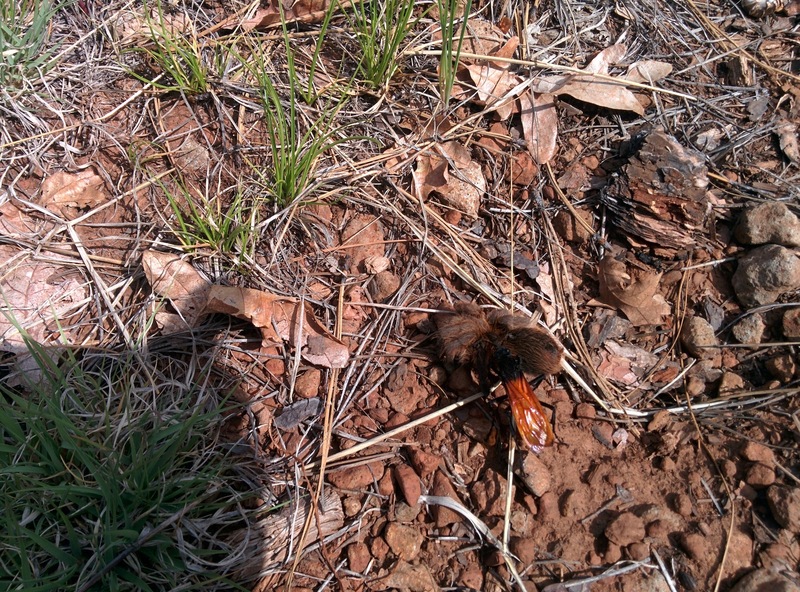 The Tarantula Hawk then proceeded to start dragging the Tarantula that obviously weighed many times more than itself. The wasp was tenacious and worked hard as it was dragging the spider backwards while having to work its way over, around and through grasses, bark, rocks and logs. The spider was still alive as it would occasionally move a leg or slowly assume a simile of its normal defensive posture but couldn’t do anything more than that. To give you an idea of the size of this wasp I put my hand down next to the spider for a moment to take a quick picture. I did this knowing full well that this particular species of wasp has a 1/4 inch (7mm) stinger, the second most painful (but essentially harmless) sting in the insect world and that they usually (oh please, oh please) don’t sting unless annoyed by being handled. I had read that, if this went wrong, my only recourse would be to fall on the ground and scream for three minutes as the pain makes it impossible to think or communicate coherently. In the short movie below you can see that as soon as my hand was down there the wasp saw it and decided to come check out this new, hairless, possible bit of prey and came skittering towards my hand. Needless to say I screamed like a little girl and snatched my hand away. Willow got a bit too close and the Wasp released its prey and moved away for a moment giving me the chance to pick up the spider and take a closer look. Looking down I could see the wasp frantically looking around again for its prey. At this point having had tarantulas as pets before I knew what fate had in store for this hapless spider which was, as the Wikipedia entry states: “When the wasp larva hatches, it creates a small hole in the spider’s abdomen, then enters and feeds voraciously, avoiding vital organs for as long as possible to keep the spider alive. After several weeks, the larva pupates. Finally, the wasp becomes an adult, and emerges from the spider’s abdomen to continue the life cycle.” So, yeah, eaten alive from the inside out. Bad way to go by anyone’s definition. 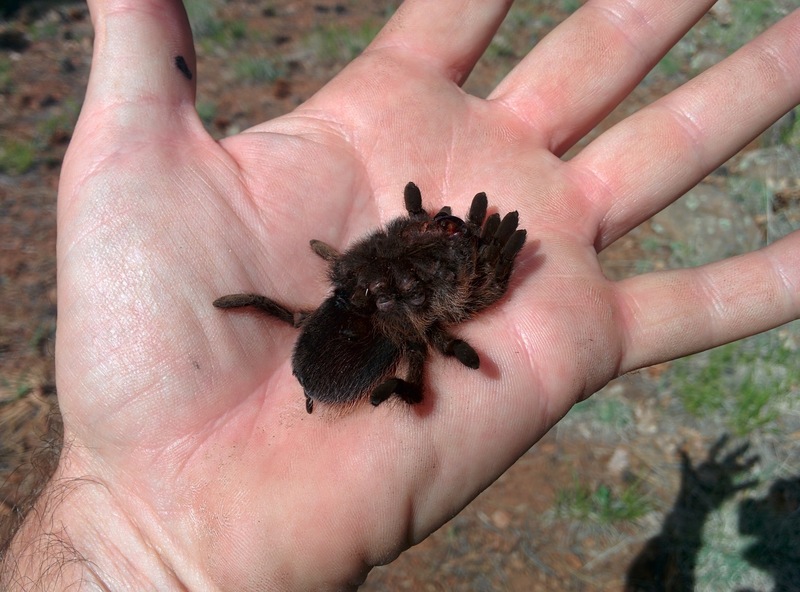 As I like tarantulas I then made a poor decision to not let nature take its course. I got out my EDC Benchmade knife, set the poor spider down and euthanized it by bisecting its head with the blade. Its legs, which moments before could barely move, did their much faster death twitches and then it became still right as the wasp found it and proceeded to perform a complete and thorough 360 degree inspection of the spider. You could tell that the wasp knew something was different about the spider now what with all its milky spider blood about. We took the wasp’s momentary confusion at this new state of affairs to offer our silent condolences to the tarantula and apologies to the wasp as we slunk away. I know the spider had the best possible outcome. I also know that I had most likely only delayed the wasp from laying her egg until she caught her next tarantula and that, unlike the standard prey-to-predator ratio of 1 catch for 10 attempts these wasps are, literally, more like 99 times out of 100 successful. So, in the moment I made a mistake and interfered in a life and death struggle but it was an interesting and exciting learning experience which we will hopefully observe but not be a part of again.